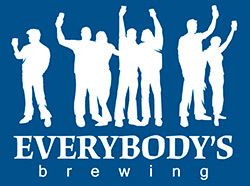 Press Release - White Salmon, WA - On Wednesday, Nov. 25, Everybody's Brewing will begin selling 22 oz. bottles of barrel aged, and specialty beers directly from it's pub in White Salmon, WA. The brewery is calling these bottles the "Local Harvest Series", as they will only be available for purchase locally at their pub. The series will roll out with two offerings: Barrel Aged Sour Cherry Saison, and Russian Imperial Stout. To celebrate, they will open their newly expanded brewery to the public for tours from 2 to 5 pm, with the opportunity to sample beer straight from the bright tanks. Owner/Brewmaster Doug Ellenberger said he's excited to finally bottle some of his beer. "We make some barrel aged, and specialty beers that we don't distribute, so we're happy to give people who visit the pub a chance to enjoy these beers at home. We're starting to see our barrel aging program mature, and this will be a great outlet for those beers." He also noted that the Local Harvest Series will rotate styles frequently, selling each new bottle only while supplies last. "We're really pleased with how these first two beers turned out", said Ellenberger. The Russian Imperial Stout clocks in at 10% ABV, and 90 IBUs. 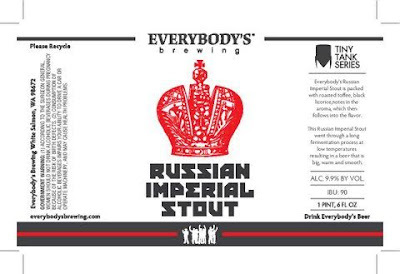 According to Everybody's, "This Russian Imperial Stout is packed with roasty, black licorice, and chocolate aromas. The rich sweetness from the big malt bill is balanced with a light bitterness. A long fermentation process at low temperatures keeps this beer clean and drinkable". 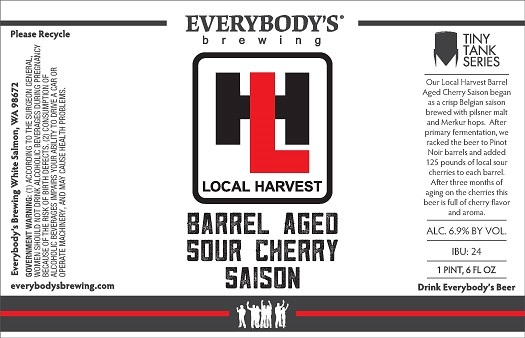 Barrel Aged Sour Cherry Saison is 6.9% ABV, and 24 IBUs. "This Saison began as a crisp Belgian Saison brewed with Pilsner malts and Merkur hops. After primary fermentation, we racked the beer to Pinot Noir barrels and added 125 lbs. 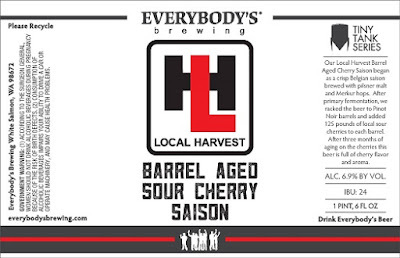 of local Sour Cherries to each barrel. After three months of aging, this beer is full of cherry flavor and aroma." If you make it out to White Salmon for this bottle release, make sure to stick around for their annual "Night Before Thanksgiving Karaoke", which starts at 8:30. Now in it's seventh year, this party never disappoints, and draws locals from all over the gorge.